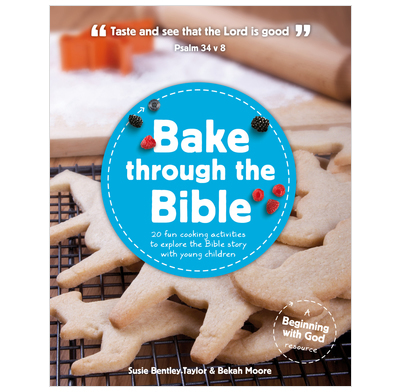 Bake through the Bible is full of different cooking activities to help parents/children's ministry leaders explore Bible stories with young children. It is written with children under 5 in mind. Under 5's will has ALOT of fun baking- however the themes tend to suit children who are aged 5-10. The book is also beautifully presented, and has really clear pictures to show children examples of what they are going to make, it is also written by parents, so it uses ingredients that children will ACTUALLY eat. The instructions are simple and easy to follow, and if you use the "time saver" section none of the activities take more than 10 minutes to make (allow extra time for cooking) so it is perfect for energetic children who are constantly on the go! What we really liked was the "washing up" and "while it is cooking" sections- these are a series of simple discussion points (these may need to be altered for the age of your child) that help link what you have made to the Bible. Some of the cooking times take up to 90 minutes, and one of the activities needs 6 hours in the fridge - which may mean that very young children have forgotten the reason why the have made it in the first place. For the age group it is aimed at, some of the themes maybe hard for them to grasp, however it doesn't take much effort to alter it to suit the age of the child. For example: with a group of under 5's we made pizza faces and changed the theme to "God made me." The parents who tried and tested this book with me said yes. They loved the variety of sweet and savoury recipes. It engaged their children and got their children excited about food that they wouldn't normally eat. They also love the discussion points which link the activities to a Bible story as this makes it easier for them to develop their kids faith at home. As someone who is not a parent but does work with children- this is a great resource for leaders who are looking for an alternative activity to do with children- it will get the kids excited and keep them engaged!